Humans have always looked upon everything in nature as resources. Forests continue to provide us a staggering range of raw and finished products. Wildlife too, are resources. And there are different ways of using these resources—we hunt deer for meat, trap tigers for skin, poach elephants for ivory. We cut trees to cook dinner, to make chairs, to lay fashionable floors. We mine ore under forests and use the iron to build bridges. But over time, there has come a small but growing realization that we cannot afford to care only about the commodified value of these resources. More importantly perhaps, we need to value and preserve them as living resources. This is where tourism offers us a very different way of valuing and utilising forest resources. The consumption of wood, meat and ore may sustain livelihoods and foster commerce. But such use also renders a resource finite. The recognition that these uses leave us with less of the resource for the future, has prompted us to explore sustainable ways of using nature to support livelihoods and further commerce. Tourism, as opposed to mining or logging, does not involve extraction and seems the ideal way of keeping a resource intact, while continuing to derive economic benefits. Ecotourism, goes one step further. Not only does it mean commercial but non-extractive use of forests and but also sharing of economic benefits with local communities. To be equitable and successful, ecotourism also has to offset the loss of livelihood for people who depend on extractive use of the forest. Unless a different way of making a livelihood is offered to the villagers who gather honey, collect firewood or graze cattle in the forest, preventing them from removing these products from the forest is not just unfair; it simply will not work. If that is the philosophy of ecotourism, how has it fared, in practice? Are we, to paraphrase a government slogan, “taking only memories and leaving only footprints” when we holiday in our wildlife sanctuaries and national parks? Let us look a little more closely at our footprints. We leave them behind in the form of large, old trees cut to make roads within forests so that we can go see wildlife. 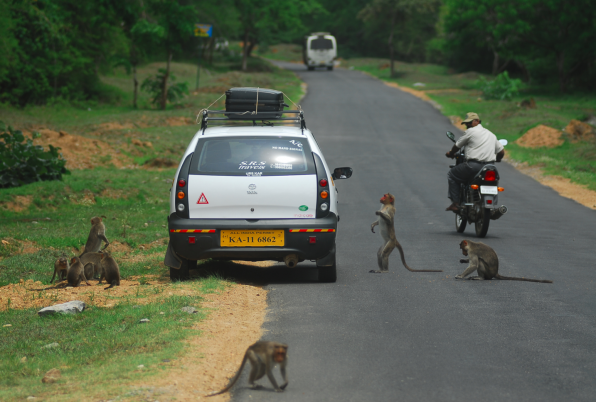 In the form of vast numbers of vehicles entering sanctuaries and parks on these roads each day. In creating and maintaining artificial ‘view lines’ on either side of forest roads by regularly clearing natural plant growth. In fact, our demand for wildlife holidays has caused the forest department to keep parks like Bandipur Tiger Reserve open to visitors even during the summer, taking staff away from fire prevention and control. We even demand evening campfires in our resorts, burning wood cut from the very forests we have come to see. In a place like Bandipur, which receives around 400 tourists each day, these footprints add up to a massive but unseen impact on wildlife and their habitat. As for sharing the economic benefits, we must ask if and how the rapid growth of wildlife tourism has benefitted local people. Your weekend may have been made memorable by the herd of elephants you saw on the morning safari. But did you know the same placid herd had just then ambled back from a raid in a jowar field right behind your resort, ruining a farmer for the year? In fact, the man who carried away your breakfast plate may have tilled the very land your resort stands on; unable to bear the losses from crop raiding elephants year after year, he may have sold it. While local communities certainly have an impact on the forests they depend on for firewood and grazing, they also subsidise conservation in ways that have almost never been measured. Were it not for the immense tolerance of local people, there would be far fewer of these wild animals for us to see. As tourists who derive the benefits of sanctuaries and parks, do we not have a responsibility to share in their costs? One way of offsetting costs is to provide employment to local people. Few, if any, resorts make it a policy to hire people from villages around the resort; it is far cheaper to employ a migrant labourer. A noteworthy exception is the government-run Jungle Lodges and Resorts where around 80% of the staff in most of their properties are from local communities. The form of ecotourism we encounter today achieves neither of its original goals. In fact, it enlarges our footprint on the forest and totally ignores the second commandment of giving back to local communities. But this can change. Ecotourism businesses, like any other, care about consumers, not crusaders. You and I can ask the right questions of our resorts, demand responsible behaviour and achieve a change that no amount of regulation can bring about. A version of this article appeared in the Deccan Herald on 11 May 2010. We also leave our footprints behind, by traveling half-way across the world to visit these places. No matter how “eco-touristy”a resort is, it can’t do away with these footprints.